This week in Paris, I was hoping to see new window displays at FSH, but recognized from far away the splendor I already captured on my previous visit in January. So no new H pics this time! 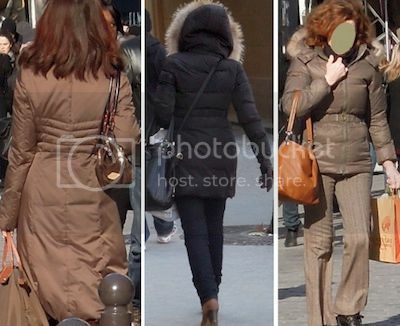 Not wanting to come back empty handed, I took a series of 'paparazzi shots' on how chic Parisians brave the arctic weather which is currently holding Europe in it's grip. I loved seeing the different ways women of all ages picked up on trends, making them into their own look. Hope you'll enjoy. Oh this was great to see, I think that outdoor pics of people fashionably bundled up for winter are so helpful. I tend to forget about even trying to look good when it gets cold. Monsieur is adorable , what a way to visit Hermes....dress in theme. I don't find any one of these half as chic as you in the froideur ! Mai Tai, Were there a lot of metallic down coats? A friend of mine showed up in a pale blue metallic coat at The Artist and I thought she looked tres chic! Next to her, I felt frumpy in my cloth! I love these photos MT! How great to see these candid photos of "On the Streets of Paris"! 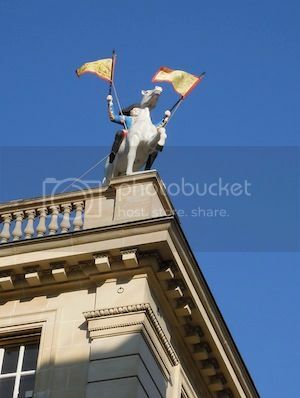 And I do love the Din Tini flags - the exact colorway that I have...! xoxL. SA, it must be the first time we did not nearly cross paths! Tabitha, I bet you look stunning in the cold, with our without effort! Estrella, LOL re extreme temperatures. Hope to visit one day when there is a heatwave.. wonder what Monsieur would come up with! emilyatheart, yes there were quite a few metallic down coats, but there were just as many matte or shimmering ones. With great accessoires any of them are über chic, no matter what the material. lanit, so happy you enjoyed the post! It was fun to take the pics, will try and play paparazzi on future trips too. The Din Tinis looked so fresh and fun against the blue sky! The man with the orange stole is a legend. You should have a separate category like this MT! Please share and inspire us even more! Thank you for the great candid shots; this will make me think twice before I leave the house today, and also not just rush down the street with my head down against the wind, but look around and check out everyone! Thank you for the inspiration to all of us huddling down in the cold. Now where did I put that orange fur scarf! a must have! How interesting to see how Parisians protect themselves from the cold weather! Monsieur is just amazing! Thank you so much, my dear MaiTai to talk us along with you to Paris once again. Warm cosy hugs, M.
How I enjoyed seeing all of the puffy coats, wool coats (loved the woman in navy), and fur coats, but my most favorite, of course: monsieur. What panache! Thank you sharing these wonderful pictures, I am a big fan of your blog. I recently come across a chance to a vintage Hermes cashmere scarf " coaching " in 140, and was really wonder if I should get it. My ideal size would be 90 and it can be easily wear with everything including the fur caller that I got in you collection. However it was such a beauty. Mai Tai, please help, would you recommend it? Many thanks for the lovely comments, dear Maritine, Anonymous, Leslie, cigalechanta, weave and spin, Manuela, CS, Sherlene, and Lara, so happy to hear you enjoyed sharing this trip with me! 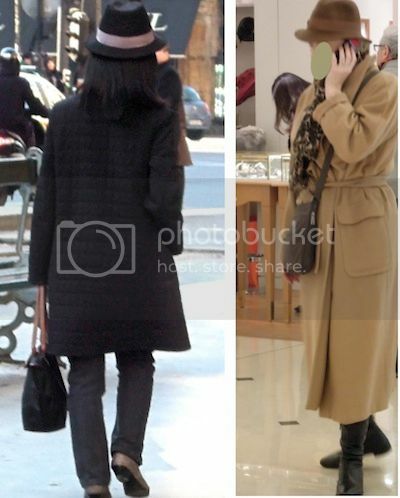 Anonymous, I wore black (jeans, rollneck) with brown (reversible shearling coat, ankle boots, Birkin), accessorized with black/naturel Ex-Libris cashmere GM and CDC bracelet in black croc. cigalechanta, I wish I could help, but I honestly do not know where to find an anorak like you described. You could try via google, or search on-line boutiques. Bonne chance! Sherlene, I adore the Coaching design, and personally love the GM version too. If you think you’d enjoy wearing a cashmere shawl, it is a good opportunity to start with a design you really love (and you can wear it with a fur collar too http://scarffurcollar.blogspot.com/search/label/Cashmere%20GMs). But if you rather stick to silk carrés, I would pass. Good luck on your decision. Wow, I love that gent in his orange fur stole. So understated!!! haha. Fabulous in every sense of the word.